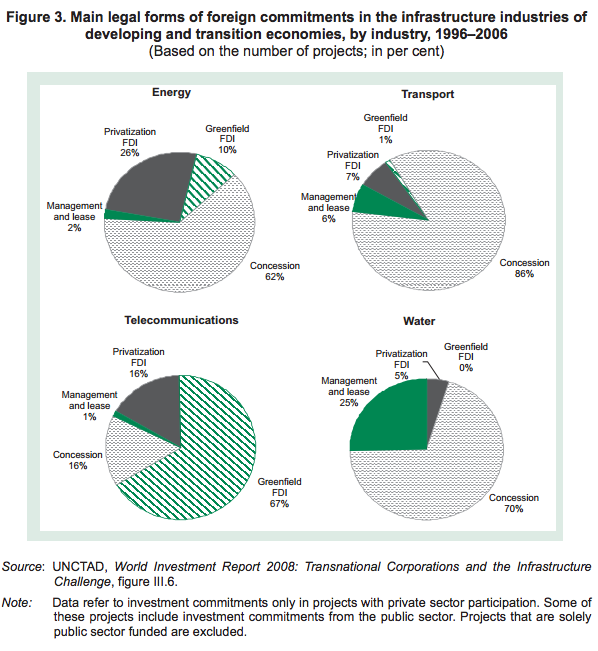 There are huge unmet investment needs for infrastructure in developing countries. The provision of good quality infrastructure is a prerequisite for economic and social development. Indeed, it is considered one of the main preconditions for enabling developing countries to accelerate or sustain the pace of their development and achieve the Millennium Development Goals (MDGs) set by the United Nations. Moreover, the future investment needs of developing countries in infrastructure far exceed the amounts being invested by governments, the private sector and other stakeholders, resulting in a significant financing gap. On average, according to World Bank estimates, developing countries currently invest annually 3–4% of their GDP in infrastructure; yet they would need to invest an estimated 7–9% to achieve broader economic growth and poverty reduction goals. Partly because of the scale of investment required in infrastructure, there has been a fundamental change in the role of the State around the world. Governments have opened infrastructure industries and services up to much greater involvement by the private sector – including TNCs. After the Second World War, and until the 1980s, infrastructure industries were by and large the purview of the State, sometimes through corporatized forms, such as State-owned enterprises (SOEs). Since then they have been gradually liberalized, though the pace and degree have varied by industry and country. As a result, the relationship between the State and the private sector has evolved, with the State increasingly assuming the role of regulator of activities performed by private, and often foreign, companies. This new relationship will continue to change in response to technological progress, growing experience with private sector involvement and shifting political priorities. WIR08 focuses on economic infrastructure, including electricity, telecommunications, water and sewage, airports, roads, railways and seaports (the last four collectively referred to as transport). Analyses of TNC activities, development effects and policy recommendations need to take into account the main features of these industries. First, infrastructure investments are typically very capital-intensive and complex. Second, infrastructure services often involve (physical) networks, and are frequently oligopolistic or monopolistic in nature. Third, many societies regard access to infrastructure services as a social and political issue. Such services may be considered public goods, in the sense that they should be available to all users, and some, such as water supply, are considered a human right. Fourth, infrastructure industries are a major determinant of the competitiveness of an economy as a whole, and the quality of infrastructure is an important determinant of FDI. Fifth, infrastructure is key to economic development and integration into the world economy. TNC participation in infrastructure has increased substantially, including in developing and transition economies. Infrastructure industries account for a rapidly expanding share of the stock of inward FDI. Over the period 1990–2006, the value of FDI in infrastructure worldwide increased 31-fold, to $786 billion, and that in developing countries increased 29-fold, to an estimated $199 billion. Throughout the period it continued to grow in most infrastructure industries: the most significantly in electricity and telecommunications, and much less in transport and water. As a whole, the share of infrastructure in total FDI stock globally currently hovers at close to 10%, compared to only 2% in 1990. Another measure, foreign investment commitments in private participation in infrastructure (PPI) projects (which include FDI, but also other investments that are an element of concessions), also indicates that TNCs have invested significantly in developing countries. During the period 1996–2006, such commitments amounted to about $246 billion, with a concentration in Latin America and the Caribbean between 1996 and 2000 (the region accounted for 67% of commitments); but since the turn of the century TNCs’ share participation in PPI projects has grown relatively faster in Africa and Asia. The group of LDCs has remained by and large marginalized in the process of globalization of infrastructure investment, accounting for about 2% of the stock of infrastructure FDI in developing countries in 2006. Their share in the foreign investment commitments in infrastructure industries of developing economies in the period 1996–2006 (of $246 billion) was a little over 5%. The form of TNC involvement varies considerably by industry. 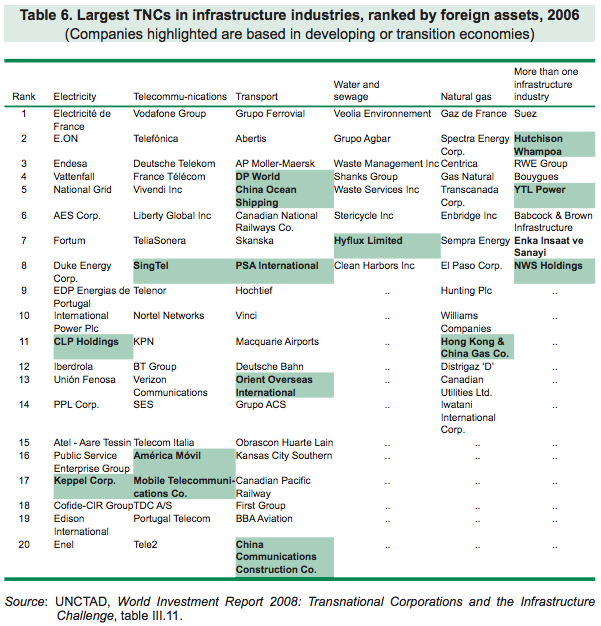 Telecommunications is the only infrastructure industry in which FDI has been the dominant form of TNC entry in developing and transition economies (figure 3). In electricity, concessions were the most frequent modes of entry (62% of the cases), followed by privatizations and greenfield projects (36%) (figure 3). Concessions were also the predominant form of foreign participation in transport infrastructure (more than 80%), and in water (70% of the projects). In addition, the water industry used management and lease contracts relatively frequently (25%) (figure 3). Developing countries have significant infrastructure TNCs and are becoming prominent investors in other developing countries. Although developed-country TNCs still dominate in infrastructure industries internationally, there has been a marked rise in involvement by developing-country TNCs. In some industries, such as telecommunications, they have emerged as major players, and in others, such as transport, they have even become world leaders (table 6). Of the top 100 infrastructure TNCs in the world in 2006, 14 were from the United States, 10 from Spain, and 8 each from France and the United Kingdom. However, of the top 100 infrastructure TNCs, no less than 22 were headquartered in a developing or transition economy. The largest number of such firms was from Hong Kong (China) with 5 firms, and Malaysia and Singapore with 3 each. TNCs in infrastructure derive their competitive advantages from a variety of sources and invest abroad mostly to access markets. Competitive or ownership advantages of infrastructure TNCs are primarily related to specialist expertise or capabilities, such as network design and operation, engineering skills, environmental know-how, project management capabilities and tacit, hands-on skills. Specialized business models and financial prowess are important in some industries and segments, such as telecommunications. The majority of infrastructure TNCs invest abroad in order to access the markets of host economies. They aim at benefiting from market opportunities arising from a number of measures, including liberalization and deregulation in host economies, invitations to tender for infrastructure projects, and the opening up of host countries to foreign acquisition of local firms (including privatization and acquisition of private firms). Additional motivations for investment can include following clients in the infrastructure business, searching for economies of scale and taking advantage of regional growth opportunities. The primacy of the host country market as a motive for infrastructure TNC involvement in developing economies places LDCs at a disadvantage in attracting their investment, as they have small markets in general and in infrastructure industries more specifically. Mobilization of financial resources for infrastructure investment by TNCs is rising, but a vast gap remains. Financial constraints faced by governments were a major reason for an increasing number of developing countries to open up to FDI and TNC participation in infrastructure industries in the 1990s. Indeed, TNC participation in infrastructure in developing countries has resulted in the inflow of substantial financial resources. As mentioned earlier, the stock of infrastructure FDI in developing countries, an indicator of the extent to which TNC participation mobilizes financial resources, surged after 1990. 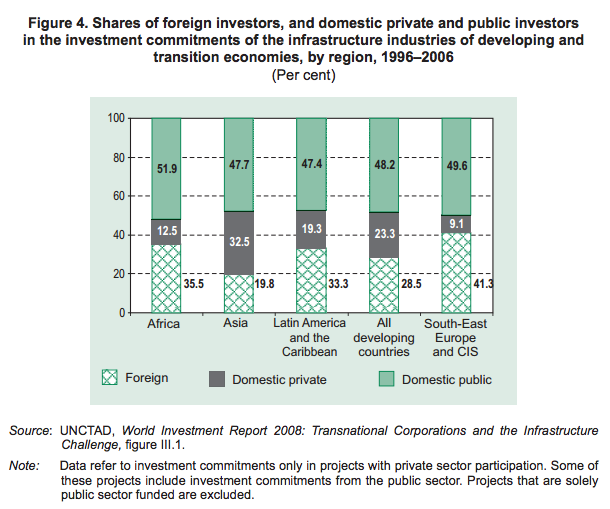 In addition, the $246 billion foreign investment commitments in infrastructure in developing countries in the period 1996–2006 represented an average of 29% of all PPI investment commitments. This reflects the importance of TNCs contribution to these industries in developing countries, with the highest share in Africa (36%) (figure 4). Despite significant levels of TNC investment in developing-country infrastructure, more of it is required to bridge the vast financing gap: there is need for substantial amounts of additional investment, irrespective of source. For instance, in Africa, total TNC investment commitments in infrastructure during the decade spanning 1996–2006 were $45 billion – an amount (even if fully realized) that is barely equivalent to the region’s current annual infrastructure investment needs of $40 billion. Across much of Latin America, in a similar vein, investment in infrastructure by foreign companies in the 1990s was connected with a decline in public investment in the sector. In expectation of a large-scale increase in private sector investment, many governments in the region cut back on public expenditure in infrastructure, but the increase in investment by TNCs (and the domestic private sector) did not fully compensate for this decline. An important lesson from this experience is that TNC participation should not be expected to meet a country’s entire investment needs in infrastructure industries; rather, it should be viewed as an important supplement and complement to domestic investments. TNCs in infrastructure bring both hard technology (e.g. specialist equipment for water purification) and soft technology (e.g. organizational and managerial practices) to their operations in host countries. As regards hard technology, in telecommunications for instance, market entry by international operators from both developing and developed countries has contributed to lowering the threshold of access to and use of information and communication technologies in developing countries. TNCs also transfer soft technology to host country operations, for example by re-engineering operational processes, improving procurement and subcontracting practices, and enhancing client records and collection methods. Overall, studies show that in a number of cases the introduction of hard and soft technology by foreign affiliates has helped enhance productivity in services provision, as well as its reliability and quality. However context matters, and performance gains as a consequence of TNC (and more generally private) involvement depend very much on a well-defined regulatory environment. The industry-wide impact of technology transfer by TNCs also depends on the diffusion of technology to other firms in the industry through a number of routes of transmission, including joint ventures, mobility of personnel and demonstration effects. For instance, in China’s electricity generation industry, TNC participation in large joint-venture projects has involved systematic and comprehensive project management cooperation between foreign investors and their Chinese counterparts. This has enabled the latter to enhance their expertise and efficiency. For the effective diffusion of technology from infrastructure TNCs, the existence of capable domestic enterprises is essential. The higher the contestability of an infrastructure industry, the more likely it is that TNC participation will contribute to enhanced efficiency through increased competition. For example, in many countries, a competitive market structure has been established in telecommunications as a consequence of technological change and industry reforms. In Uganda, for instance, competition between the national provider and TNCs led to price reductions and a rapid increase in penetration of mobile telephony. Cross-country studies have shown the complementarities between privatization and competition: competition increases the gains from privatization, and vice versa. On the other hand, in water supply, which is an example of an industry that is still essentially a natural monopoly, the entry of TNCs can result in State monopolies being turned into private, foreign-owned monopolies. This limits competition and thus the scope for efficiency enhancement. In other services, while the entry of TNCs can increase competition and thus efficiency, it may also pre-empt the entry of domestic players or crowd out existing ones. In electricity and telecommunications – both relatively contestable industries – the experience of a number of developing countries indicates that infrastructure TNCs in some cases can be associated with anticompetitive behaviour. In some developing countries where domestic capabilities exist, local private participants can enhance their competitiveness and efficiency by collaborating with TNCs in a variety of ways. For example, partial privatization with minority ownership by TNCs has been implemented by developing countries such as Morocco in telecommunications, with favourable results for competition. As an alternative to TNC involvement, some developing countries have also been able to improve the performance of public utilities through corporatization reforms, without direct TNC participation. However, successful cases are mainly in relatively high-income or large developing economies. …with implications for the provision of infrastructure services and universal access. The participation of TNCs has generally increased the supply and improved the quality of infrastructure services in host countries, but their impact on prices has varied. In some instances this has caused concern over services being priced beyond the reach of the poor. In particular, the affordability of services is jointly determined by the price of services and the disposable income of consumers in an economy. The impact of TNC participation on access to services can thus differ among segments of a society: improvements in industry performance do not necessarily translate into increased availability and affordability of services for all members of a society, especially the poor and people living in rural, remote and economically deprived areas. Improvements in supply, coverage of services, price and access as a result of TNC participation in developing countries are more pronounced in telecommunications than in any other infrastructure industry, especially in mobile telephony. Many developing countries have experienced a “mobile revolution”: new business models introduced by TNCs have enabled the expansion of mobile services into low-income segments. TNC entry into the transport industry of developing countries is far more varied than in other areas. International terminal operators, for instance, have considerably improved the quality of services in major ports, and thereby increased developing-country connectivity to the global economy. In contrast to telecommunications, and to a lesser extent transport, the impact in electricity and water has been mixed. The impact of TNC participation on prices, and thus access to electricity and water, depends on political, social and contractual issues, as well as productivity and efficiency gains. In the absence of government subsidies to users, additions to supply capacity, productivity and efficiency improvements may be insufficient to maintain low prices while covering costs. Prices can continue to be subsidized after entry by the private sector, although countries sometimes raise tariffs both to attract companies and to reduce subsidies. Evidence from a number of developing countries suggests that greater private sector investment – often with TNC involvement – has in many cases led to increased supply capacity and network connections in electricity, and thereby to steady improvements in the reliability and quality of service in the industry. Given the many factors involved, electricity prices have sometimes fallen after TNC entry, but overall there has been no definite trend in prices, up or down. The impact of TNC participation on users’ access to water has been disappointing in many instances, though there is some evidence that well-designed schemes for TNC participation have led to significant service expansion. Partly because TNC participation has sometimes not met expectations of improved access, there have been cancellations of water concessions in countries such as Argentina, Bolivia and the Philippines. In summary, in the telecommunications and transport industries, the TNCs have contributed substantially to making services more affordable and accessible. For those services that are considered essential, such as drinking water, if the efficiency improvements achieved by TNCs cannot allow them to maintain prices at low levels while covering costs, and the government does not provide subsidies to users, access for the poor is affected. Government policies are critical for all infrastructure industries, but, from a social perspective, more so in the case of electricity and water. Leveraging TNC participation is a complex policy challenge. Host countries need to consider when it is appropriate to draw TNCs into the development and management of infrastructure. They also need to find ways of ensuring that projects with TNC involvement lead to the expected development effects. This is a complex policy challenge. As policy priorities and options vary between countries, so too does the optimal mix of public and private (including TNC) investment. Designing and implementing appropriate policies to harness the potential role of TNCs in infrastructure require adequate skills and capabilities. Governments need to prioritize among competing demands for different projects, establish clear and realistic objectives for the projects chosen, and integrate them into broader development strategies. This means that government agencies have to possess the necessary institutional capacity and skills to guide, negotiate, regulate and monitor the projects. This applies not only at the central level, but also at the provincial and municipal levels. While many developing countries seek foreign investment to develop their physical infrastructure, convincing foreign companies to invest has become even more challenging. Growing demand in the developed world and in large emerging economies is leading potential investors to expect higher returns for a given level of risk. This poses a particular problem where large-scale capital investments are needed up-front, where cost-recovery is difficult to achieve and where social concerns are considerable. Furthermore, project failures and multiple investment disputes have contributed to a more cautious attitude towards infrastructure projects among overseas investors. Countries seek greater TNC involvement in infrastructure, but openness varies by industry. The trend towards opening up has been more widespread among developed countries and the relatively advanced developing and transition economies. While the nature of liberalization has varied, all groups of countries are now more welcoming to TNC activities in infrastructure than they were two decades ago. However, there are significant variations by industry. Openness is the highest in mobile telecommunications, and the lowest in water. Countries are generally more open to TNC involvement in industry segments that are relatively easy to unbundle and expose to competition. Openness also appears to be greater in countries with more developed institutional and regulatory capabilities. At the same time, some governments are becoming more careful about allowing foreign companies to take control of certain infrastructure, including power generation and distribution, port operations and telecommunications. New restrictions have been proposed based on national security or public interest concerns. These concerns notwithstanding, many countries have moved beyond the removal of barriers to TNC involvement, and are actively promoting it in some areas of infrastructure. Many investment promotion agencies (IPAs) are targeting infrastructure industries. In a survey conducted by UNCTAD and the World Association of Investment Promotion Agencies, about 70% of the IPA respondents stated that they were actively seeking such investment, while only 24% were not. Almost three quarters of the IPAs stated that infrastructure is a more important priority than it was five years ago. Confirming the broad patterns of openness to TNC involvement, the infrastructure industries most often targeted by IPAs are electricity generation, Internet services and airports. By contrast, the lowest number of IPAs targeted electricity distribution and transmission (table 7). Judging from the patterns of investment in LDCs, there may be a case for low-income countries to target TNCs from other developing countries, especially in transport infrastructure. Securing development gains requires an appropriate governance framework and strong government capabilities. Without an adequate institutional and regulatory framework, the risk increases that countries will lose out by opening up to TNC participation. Moreover, once a country liberalizes, it is often hard to reverse the process.This is why the sequencing of reforms is important. Ideally, competitive restructuring, the introduction of regulations and the establishment of an independent regulatory agency should precede steps towards opening up. Such a sequence helps clarify the rules of the game for potential investors and makes governments better prepared for engaging in a specific project. However, in reality, opening up to foreign investment has often preceded comprehensive reform, with less positive outcomes as a result. Until credible regulatory bodies can be established, developing countries are likely to be better off keeping their utilities in the public sector. Inviting TNCs to deliver infrastructure services tends to place more, rather than less, responsibility on public officials. Infrastructure investments typically require the negotiation of contracts between the host country and the foreign investor(s). Contracts provide for a tailor-made agreement that responds to the particular requirements of each project and to the intentions of the contracting parties. It is therefore important for countries to develop the expertise to determine the desirable level and forms of TNC involvement, to negotiate and monitor the implementation of projects. Due to asymmetries of information and experience between a TNC and a host country government, it is generally difficult for public sector staff to match the resources of the private sector when engaging in contract negotiations. Major TNCs tend to make use of international law firms and other experts specializing in project financing transactions, but this is not always possible for developing countries. If countries with limited experience decide to involve TNCs in infrastructure projects, it may be advisable for them to start on a small scale rather than adopting a major programme across industries. It may also be useful for them initially to concentrate on less contentious segments of an industry. Many investment disputes are related to infrastructure. An issue that has attracted increased attention in recent years is the rise of investment disputes related to infrastructure. At the end of 2007, some 95 disputes (or one third of all known treaty-based investor-State disputes) were related to electricity, transportation, telecommunications and water and sanitation (figure 5). 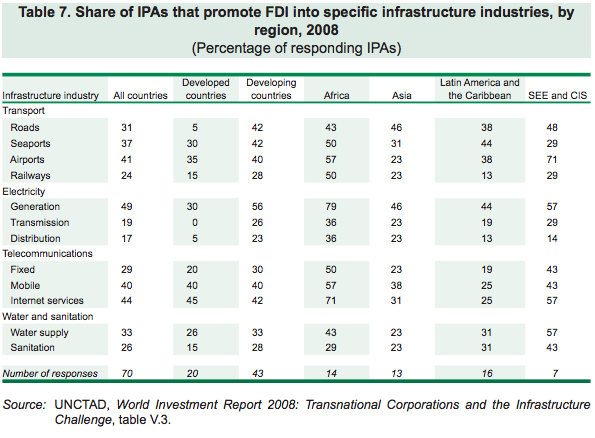 The disputes have provoked debate over the implications of international investment agreements (IIAs), and especially BITs. Some observers are concerned that improved protection and certainty for foreign investors has come at the cost of too much reduction in the government’s regulatory flexibility. They argue that the possibility of investor-State arbitration may have a dampening effect on the ability of the States to adopt public welfare regulations and other regulations in their citizens’ interests. Others question whether BITs have been, or ever will be, able to provide the protection they were originally intended to offer investors. TNCs that have seen their cases dismissed or received far lower compensation than what they had claimed will have found that the protection offered through the BITs was less comprehensive than expected. A review of arbitration decisions shows that less than half of the awards rendered favoured the claimant, and that damages awarded were considerably smaller than the total claims made by investors. The fact that more than 90 known disputes concerned infrastructure shows that concluding IIAs (and the coexistence of IIAs and State contracts) can have significant implications for host States. At the same time, the number of disputes should be seen in the light of the several thousands of IIAs, and a huge number of investment projects in infrastructure. In addition, if renegotiations of contracts are successful, they do not reach the stage of dispute and arbitration. The complexity of related issues, together with the dynamic evolution of the IIA universe and the international case law, underline the importance of capacity-building to ensure that developing-country governments understand the implications of concluding IIAs. They also need to be better equipped to handle potential investment disputes. It is important to consider the potential role of home countries and the international community in facilitating more foreign investments into countries that seek such inflows. This is particularly relevant from the perspective of low-income countries, which lack domestic capabilities and have generally failed to attract significant TNC involvement in infrastructure. Without some form of subsidies, it is difficult to attract TNC investment into economies, communities and industry segments that are characterized by weak purchasing power and poor records of payment. In these cases, development finance institutions can act as catalytic financiers. Especially in such industries as electricity, water and transport, there is significant potential for synergies between foreign investment and overseas development assistance (ODA). By making more funds available, development partners and the home countries of the investing firms could play a major role in helping to “crowd in” foreign investment into infrastructure projects in developing countries. While development partners have recently scaled up their ODA commitments for infrastructure development, current levels of support have not recovered from the earlier period of declining lending by multilateral banks, and they have not reached the levels promised in various international forums. Moreover, while development partners are yet to provide all the funds pledged to scale up infrastructure investments in low-income countries, existing funds are not being fully used – a situation that can sometimes be referred to as the “infrastructure paradox”. Recent assessments show that the liquidity of development finance institutions is very high. Development partners should honour their commitments related to ODA for infrastructure. Institutions that provide bilateral or multilateral development finance also need to become more willing to take risk and to allocate a greater share of their activities to the needs of low-income countries. In addition, they should keep all options open. While a strong case can often be made for facilitating greater involvement of the private sector, including TNCs, other approaches should not be ruled out. In some projects, notably in water and some electricity segments, there may be strong arguments for keeping the operation of the services in public hands. But also in other industries, weak institutional capabilities may make private sector involvement too risky. In such situations, international efforts focused on supporting existing public sector producers may be more appropriate. Development partners should therefore give sufficient attention to financing infrastructure projects for which it may not be possible to mobilize private sector involvement. …including to mitigate risk and build capacity in low-income countries. Risk-mitigation measures by home countries and international organizations can help in the short term to mobilize private financing of infrastructure projects in developing and transition economies. Special attention may have to be given to measures aimed at mitigating three broad types of risk: political risk (including subsovereign and contractual and regulatory risks), credit risk and exchange-rate risks. Despite the plethora of risk-mitigation instruments available, current programmes are insufficiently tailored to the situation of low-income countries. For example, local currency financing by development finance institutions typically requires a well-established currency swap market. Where such a market exists, intervention by development finance institutions is less likely to be needed. At the same time, riskmitigation instruments should not be seen as a panacea. Too much risk mitigation may lead to problems of moral hazard and encourage reckless risk-taking on the part of investors and lenders. While risk-mitigation tools can facilitate the mobilization of private debt and equity, they do not make poorly structured projects more viable. This underscores the importance of capacity-building efforts. Such efforts are especially important in LDCs. Depending on the specific circumstances of each country, assistance may need to be provided for developing legal and regulatory frameworks, assessing different policy and contractual options, preparing project proposals, and monitoring and enforcing laws, regulations and contracts. Considering the nature of the projects, governments at all levels – national, provincial and municipal – are in urgent need of assistance. While positive steps have been taken to meet these needs, current efforts remain vastly insufficient. Disturbingly, funds available for capacity-building are not always fully used. Advisory services should be geared to providing advice not only on how to encourage investment, but also on how infrastructure can be made to fit into larger development plans and objectives. Most capacity-building support is currently provided by different financing institutions that often have a direct stake in the different projects. It would be worth exploring a more active role for the United Nations in this context. As a neutral party, the organization could complement existing players by, for example, helping developing-country governments in evaluating infrastructure contracts and developing negotiating skills. Improving the ability of governments in these areas should help secure greater development gains from investment inflows. 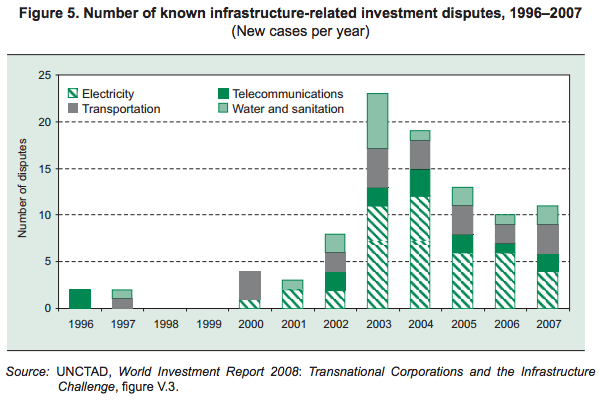 There are huge unmet investment needs for infrastructure in developing countries. TNC participation in infrastructure has increased substantially, including in developing and transition economies. Developing countries have significant infrastructure TNCs and are becoming prominent investors in other developing countries. TNCs in infrastructure derive their competitive advantages from a variety of sources and invest abroad mostly to access markets. Mobilization of financial resources for infrastructure investment by TNCs is rising, but a vast gap remains. TNC investment in developing-country infrastructure affects industry performance … …with implications for the provision of infrastructure services and universal access. Leveraging TNC participation is a complex policy challenge. Countries seek greater TNC involvement in infrastructure, but openness varies by industry. Securing development gains requires an appropriate governance framework and strong government capabilities. Many investment disputes are related to infrastructure. Greater commitments from the international community are needed… …including to mitigate risk and build capacity in low-income countries.